Kayaking with killer whales has become more popular as more and more people want to experience rare natural whale encounters. 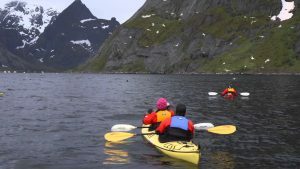 However, most kayaking tours will not use the primary orca whale-watching routes, which means that kayakers often will not see any whales during their tour. However, some kayaking companies will use the primary whale watching zones for some of their tours. Even if the tour uses a primary zone, if the tour does not spend time in a particular zone, the chances are that they will not see any orcas. To see orcas, it is important to consistently be in the right place for several hours at the right time of day. Most kayaking companies will provide a map of killer whale sighting that uses the same route as the tour. But in most cases, these maps are inaccurate and give kayakers false hope that they will see orcas during their tour. Look into tours that follow a route near the Anacortes during the summer months for a better chance of a sighting. Some have also sighted killer whales at the Lime Kiln Whale Watch Park on San Juan Island in summer, but opt for tours closer to the shore. For further information on sighting Crystal Seas suggests looking at websites that provide US government data of killer whale sightings in the summer months. You should then ask your tour company to offer you their route so that you can compare their route to that provided by government sites.